We are going on quite a long journey this summer, having decided to holiday in France and take our own car with us. I thought I would share with you the ‘Travelling Survival Kits’ that I’ve put together to keep the kids occupied during our travels. Now, I don’t for one minute think that it is a parent’s job to provide constant entertainment for their offspring. I think the notion that children need to be kept busy at all times is a fairly new concept. I could be wrong, but when I was little (and it wasn’t that long ago!) we were sent off to play and we made our own fun. Being a little bored, I believe was the spark that lit our imaginations and I have great memories of my childhood summers spent climbing trees, inventing games and organizing sports days for the entire street – complete with cardboard medals which we’d made for the winners! However, on a very long journey, I believe a few well-chosen items can help to keep everyone happy and that’s important, especially when you’ve been counting down the days until your holiday since January – everyone deserves a few weeks off and a well-earned rest now and then. Grumpy children=stressed parents=not much fun or relaxation! Kids look at the trip to a holiday destination as part of the overall adventure of going away. Going on a plane or ferry is very exciting when you are little so making the most of that enthusiasm and endeavouring to ensure that the trip is as enjoyable as possible for all is a must in my book. 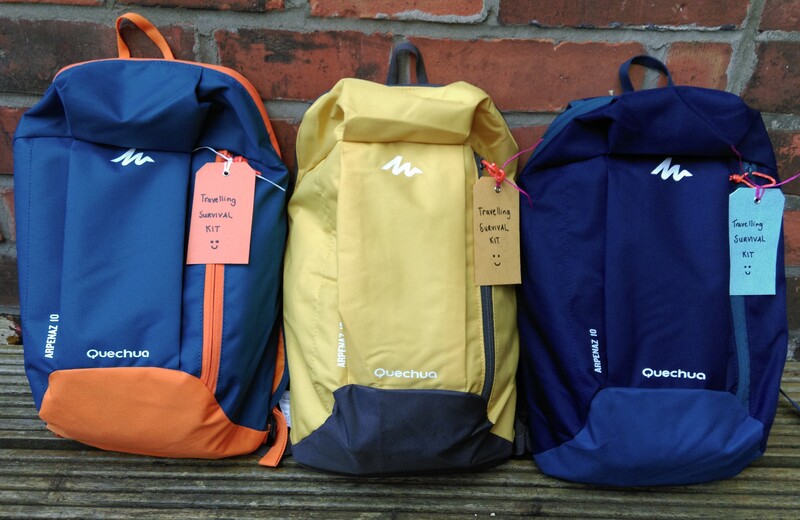 With that in mind I purchased 3 cheap rucksacks – one for each child, attached a ‘Travelling Survival Kit’ luggage tag, and suddenly a plain, boring rucksack becomes a treasure chest full of things to explore and enable adventure – when I showed them to my boys their eyes lit up. Anyone would think I was sending them off alone on an expedition to the North Pole! Another plus side of giving each child their own carry-on bag means that they can use it for any little day trips during the holiday. They can carry their own bottles of water, caps and sunglasses instead of Mum and Dad carrying everything for everyone! Plus, in my own experience kids love being in charge of their own belongings, the sense of responsibility makes them feel so grown up. I asked my husband to print off some simple maps that the children could use to follow our journey. I bought some coloured dots for them to stick on the maps each time we pass through a village or town – they can guess where on the map we are. Looking out for town names on road signs will keep them busy plus they will also like the feeling of being involved in the navigation process. 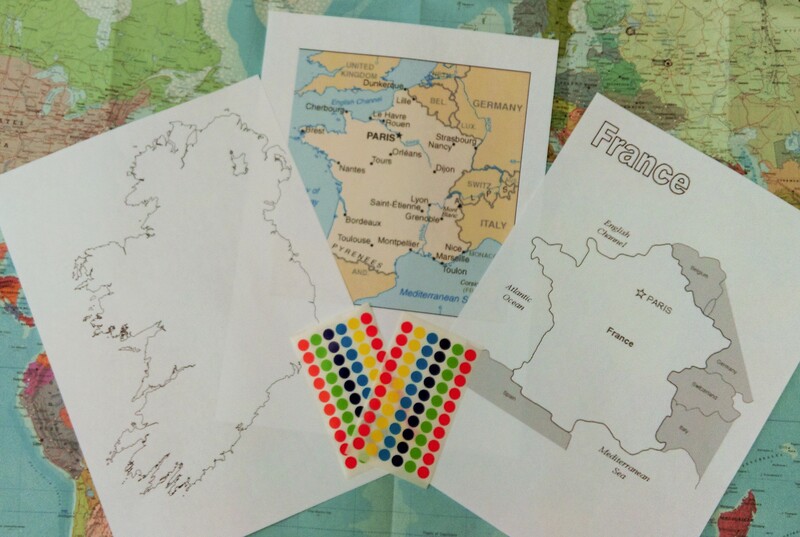 We are travelling from Ireland to France, so we have a 5 hour car drive, followed by an 18.5 hour ferry journey, then another 5 hour drive once we arrive in France, so we printed maps of Ireland and France and the kids can even use their coloured dots to chart our route across the sea! It’s not an activity that will last for hours, but surely they will benefit from learning some map skills? 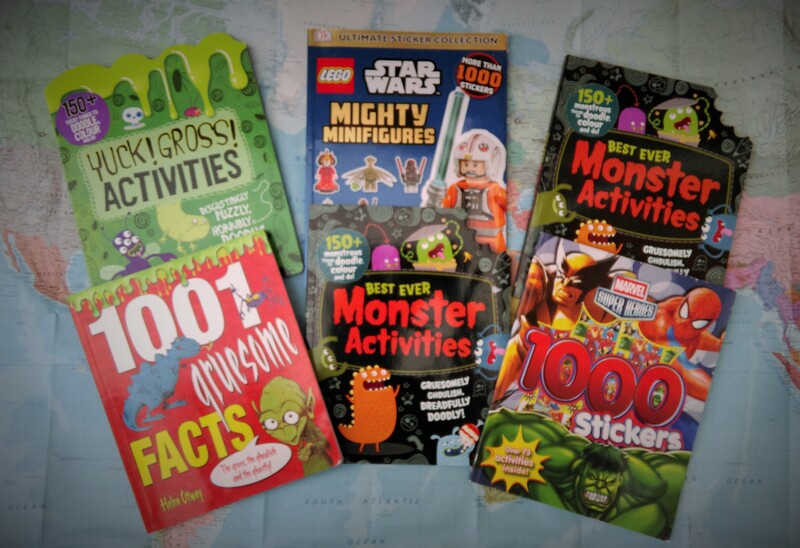 Puzzle books, complete with stickers are a great way to keep children busy while travelling. We always seem to have lots of these books in the house as they are often received as birthday or Christmas gifts. I also picked up a few lined notebooks to write and doodle in. My children have never really enjoyed colouring books (I don’t know why, I could happily colour-in for hours) preferring to draw their own pictures, making up little stories or comic strips. I filled in the first page of each notebook with a little activity – different for each child and catering to their age. Bearing in mind the end of June school reports and the suggestions made by teachers for practicing work over the summer – I incorporated this into the challenges and they won’t even know they are doing work because it’s all part of the big holiday adventure! 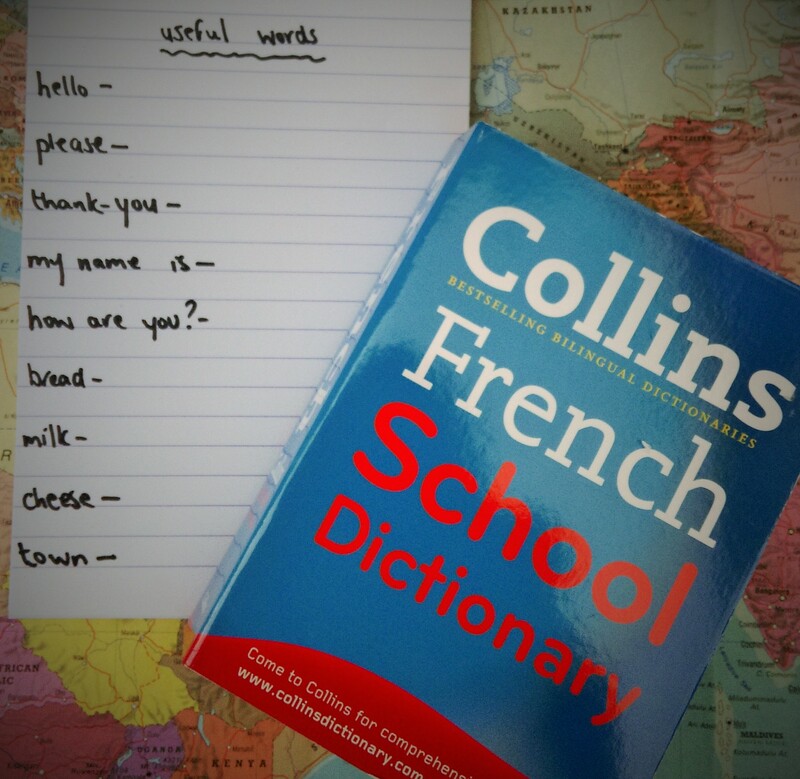 For my oldest child I picked up a cheap French-English dictionary. He is very keen to try out some French vocabulary while we are away, having already learnt some basics in school. So he can practice his dictionary skills while looking up some new words. Knowing his personality, I have no doubt he will add to this starter list not just as we travel but also throughout our stay! 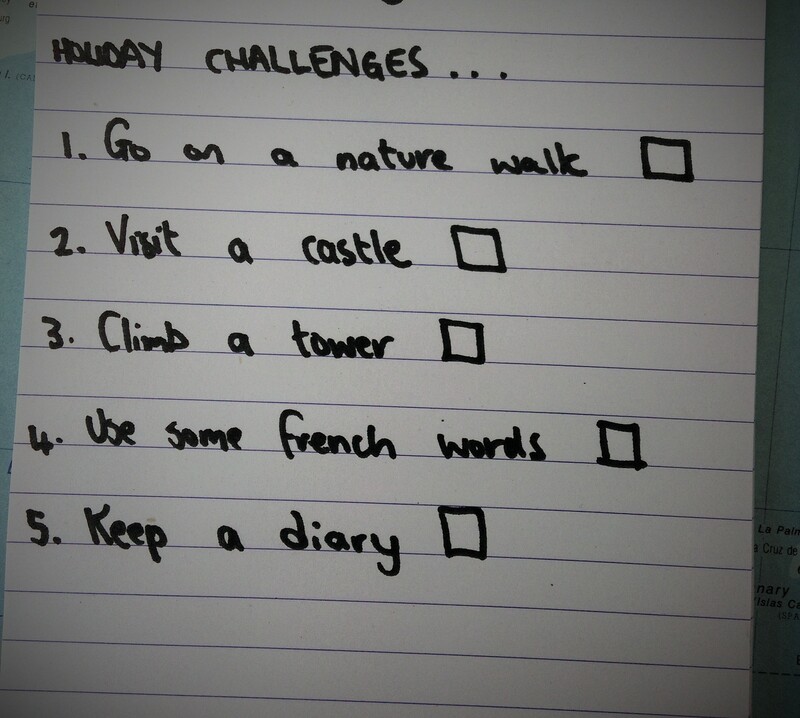 For my second child I have listed a few challenges for him to tick off during our holiday. Most of the suggestions are for things while we are away but the 5th one listed is ‘Keep a diary’ and I know that he will want to begin this as soon as we leave the house. 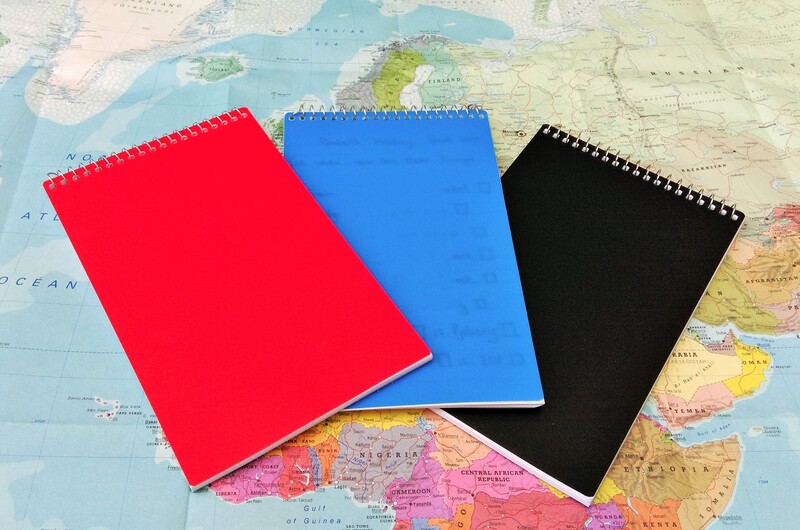 He loves to write things down in detail and draw pictures so this suits his personality – he will have a great journal of our French holiday plus he will have worked on his spelling and writing skills too – win, win! For my youngest child I have made a list of things for him to look out for and tick off as he sees them. He could even use his coloured dots and stick them in the little boxes. 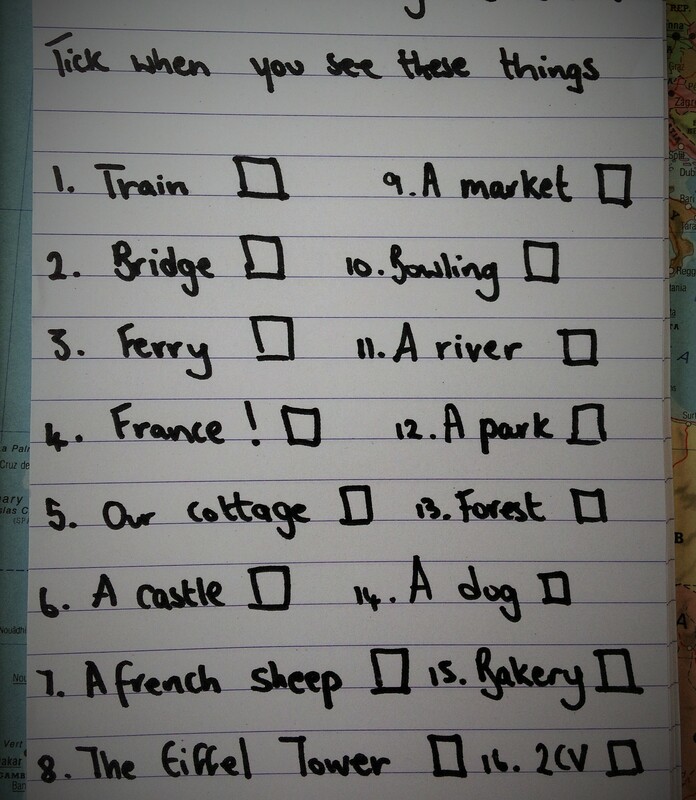 The list incorporates things for both the journey and for our time away. He loves playing games in the car, whether it be counting yellow cars or playing i-spy, but with this little list he can have fun playing and practice his reading skills too! Don’t forget to add some pencils and colouring pencils! I’ve done them in individual zip-lock bags because inevitably everyone will ‘NEEEEED’ the orange pencil at the same time! Put their names on the bags to avoid any arguments. Next to go in the bags were some travel games. I opted for simple, easy to play puzzles and games with not too many little pieces that can get lost. We have played these games at home as a family so we know they work well for us and everyone can join in. After all, we have saved all year for a family holiday so that we can enjoy some quality time together. Why not start on the journey with some good old-fashioned fun? 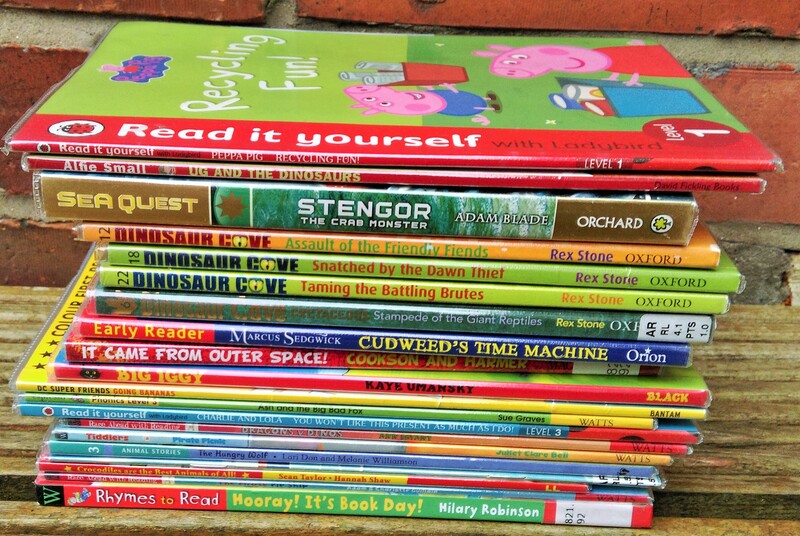 I’ve also included lots and lots of books…I’m not against ‘screen-time’. My children enjoy watching television and playing games consoles just as much as any other child. We will be bringing portable DVD players for the first time ever on a family journey. I have allowed them to pick 5 DVDs each and I don’t mind them watching a movie if they are tired. We will be travelling for 28 hours or more so I have no issue with them enjoying a bit of quiet time along the way – and I will feel no guilt about it whatsoever, because parenting is tough enough at times without adding guilt into the mix! I think as long as there are plenty of options for children to choose from the world will keep on spinning whether they decide to read a book, draw a picture or watch a DVD. We picked up this collection from the library so the boys can continue with their summer reading challenge while we are away, plus when better to enjoy some cuddles and story time together than when on a long ferry journey? We have a mixture of stories, fact books and poems to delve into. 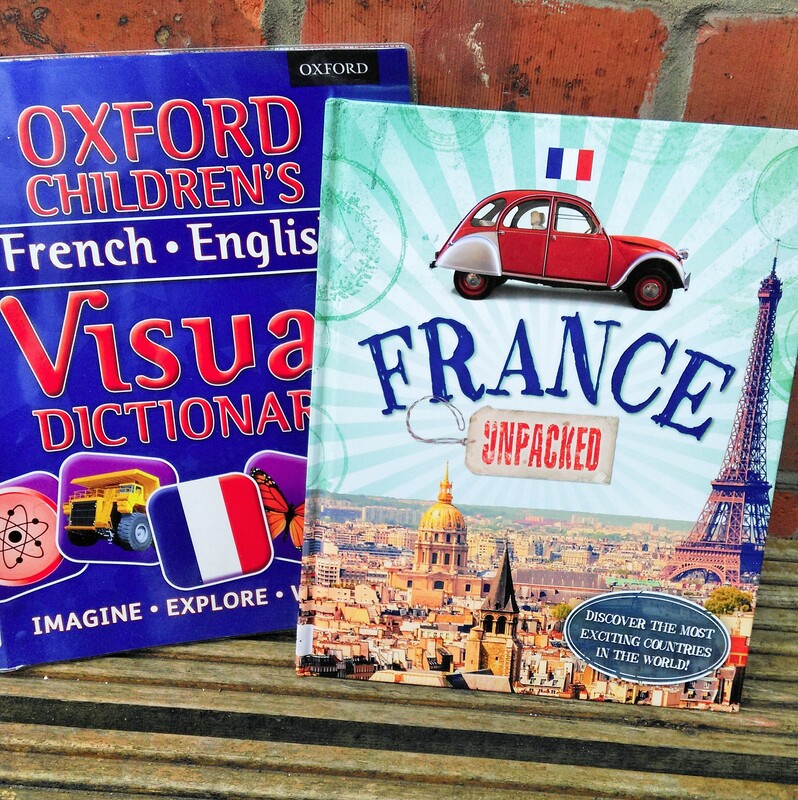 My middle son also found a few great books about France while we were at the library. Apparently he is going to ‘do some research’ while we are on the ferry. What a great idea! He can share his information with us and that way he can have a sense of pride that he has contributed to our understanding of the place we are visiting. 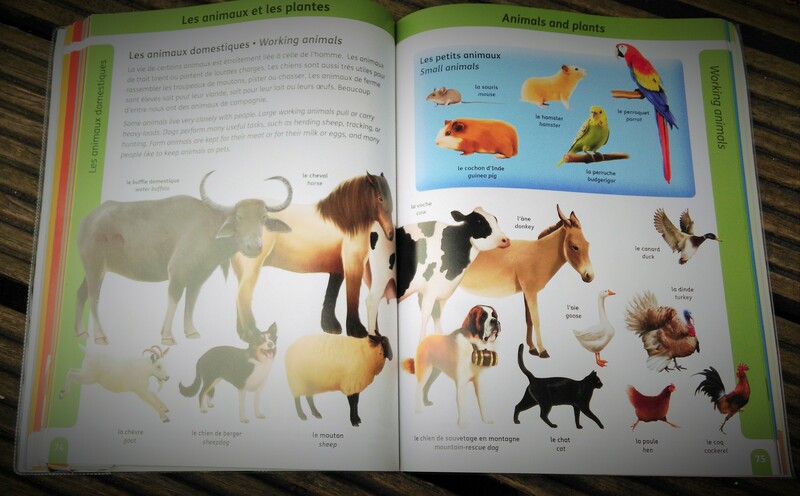 One of the books is also jam-packed with French words and phrases, complete with pictures so he can learn lots of new words too. And what would a ‘Travel Survival Kit’ be without a few treats? I’ve tried to keep the treats relatively healthy, with only a few sweets thrown in, and I will also be packing plenty of fruit to snack on and lots of water. Let’s face it, who wants to travel with children buzzing on sugar? That’s not going to be fun for anyone. Zip-lock bags are so handy for bringing along snacks on any journey and can also be used for collecting any wrappers, they even double up as sick bags in case of over-indulgence! 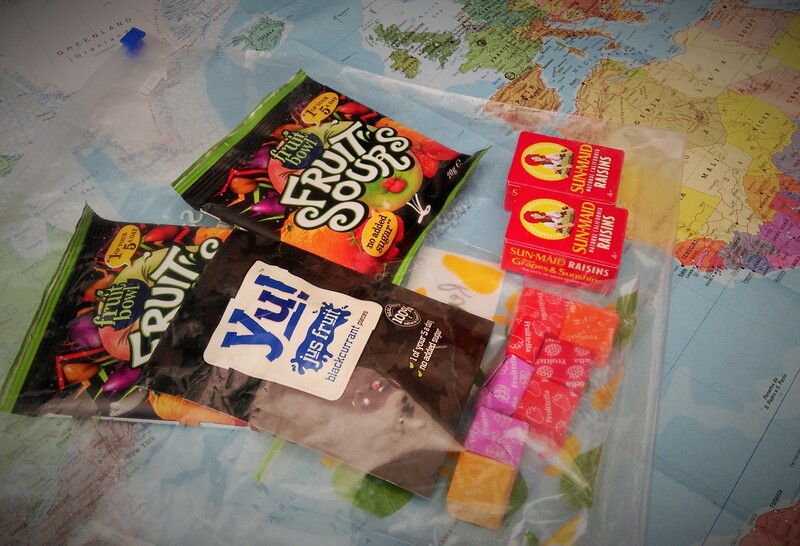 I hope that if you are travelling, either at home or abroad, with children this summer (or anytime come to think of it) that you will be inspired to make your own ‘Travel Survival Kits’. I would love to know what you pack! I will post an update, post-journey, to let you know how our kits fared – what worked, what didn’t and what else I would include next time. Wherever you are going this summer I hope you have a great time, because, really that’s what it’s all about – exploring new places and enjoying time together. It is safe to say that the ‘Travel Survival Kits’ were a definite success during our extremely long journey from Ireland to France. The maps were a real winner during the car journeys as the kids could mark our progress as we travelled and my youngest child in particular enjoyed looking for road signs and sticking dots on his map. The notebooks were used loads, each child doing their little pre-prepared challenges with enthusiasm and we also played lots of noughts and crosses and join the dots on the ferry. 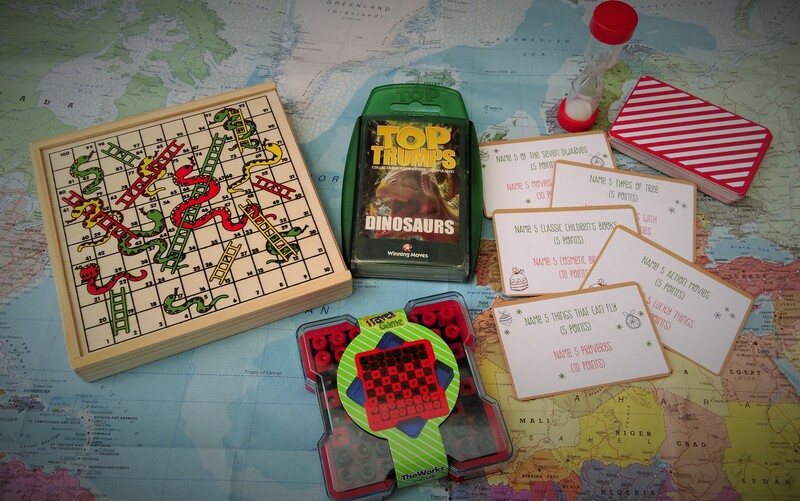 The travel games proved a real success too, especially when the boys made a few friends on board the ferry and were able to spend a few hours playing snakes and ladders, draughts and battleships. The puzzle books were great in the car and we now have one car window covered in stickers of Captain America, the X-Men and Spiderman – it looks awesome apparently! The story books were great in the cabin in the evening as well as in the car. …and of course the treat bags were a real hit with the kids and I’m glad I packed low sugar, fruit-based snacks as the boys behaviour was top notch throughout the entire journey. The ferry was very hot so the 5-litre bottle of water I took on board was all used up. We would have spent a fortune on board otherwise buying drinks. Overall….the ‘Travel Survival Kits’ were very useful and definitely made a lengthy, tiring journey that little bit easier more enjoyable for all!